Almost all software now allows you to either Export To or Save As a PDF file. You can download our PDF preset for the Adobe Suite below. If you are supplying your artwork in the native file format (original software used to create the artwork) then you also need to supply all original image files and fonts used in the document. Any images or colours that are in RGB will be converted to CMYK and a colour shift will occur. You can avoid any unwanted colour shifts by supplying all files including images in CMYK. For more consistent results you can download and use our colour profiles below. 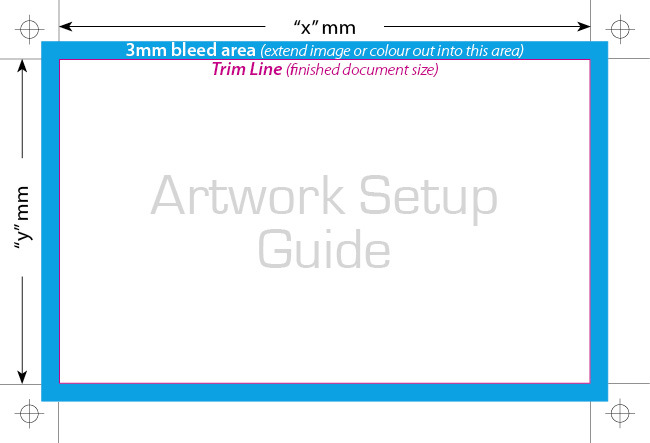 Bleeding or extending images and/or colour off the edge of the page is important if you do not want an ugly paper border after trimming.